OK, so he’s not a mutant, but he’s no ordinary cat. 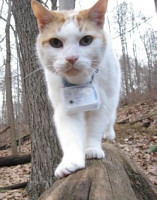 Mr. Lee has been outfitted with his very own CatCam, designed and built by his owner, J. Perthold, from a keychain digital camera and some custom circuitry. The CatCam provides a peek into the daily adventures of Mr. Lee as he prowls the neighborhood. The success of the original Mr. Lee CatCam has spawned more feline tech accessories, like the CatTrack GPS tracker and the forthcoming CatCam Live, a CatCam with integrated antenna for broadcasting live TV feeds. 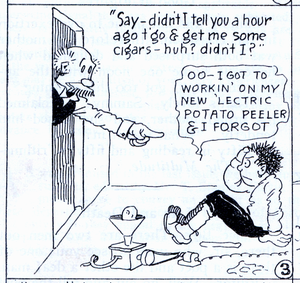 Each has detailed (but accessible) technical specifications and build notes; it’s obvious that Perthold is a real enthusiast. Mentos + Diet Coke + Zero G = Best. Experiment. Ever. 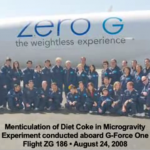 Robert Woodhead, self-described Mad Overlord and all-around geek, has posted an amazing amount of detail from his recent experiment in seeing how the Diet Coke & Mentos reaction works in microgravity. It’s a modification of the now-standard geyser-producing demonstration, but with a twist: performing the trick on a Zero G flight and recording it on a high-speed camera. The Youtube video is great, but the expanded description is even better.